It was the last day this year fishing with my Lucky Charms. 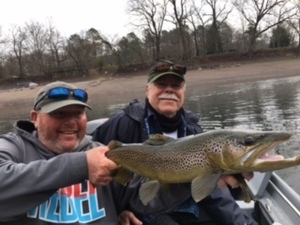 Chris and Mike Tinsley are fish catching son of a guns.I decided to go back the the state park at the upper end of the White River. It wasn't a hard decision after yesterday. We fished from the state park to Gastons and caught Brown trout everywhere we stopped. We landed 13 browns 1 rainbow and a walleye. Most of the fish were 21-22" but we had a couple good ones. 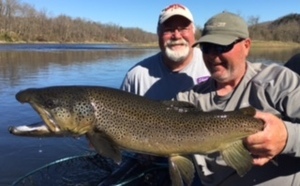 That sounds silly I have days I would jump in the water for a 22"fish.The two big ones were 24 1/2 inch male caught this morning and a 30 1/2 inch male that weighed 9.03 caught this afternoon. The bait of choice today was a sculpin. I skin the sculpins so they are easier for the browns to see. I use a #2 aberdeen hook that is threaded through the sculpin.you can drift the sculpins with a very light weight of anchor up and fish on the bottom with a #10 bell sinker. I have Scott Sheppard in the boat tomorrow. I'm betting it will be another good day.